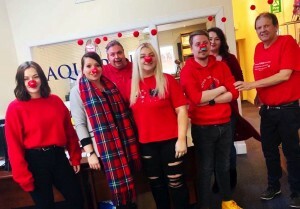 On Friday 15th March the Aquarius team saw RED as we raised over £300 for Comic Relief. Organised by Lucy, one of the youngest members of our team, she did a fantastic job of providing the office with a day of fun and games. The team who were of course dressed in red were given quizzes and word searches to work on throughout the day. Lucy arranged a bake sale with delicious baked goodies. These provided a much-needed sugar hit for everyone that was working hard taking calls that day! Classic fun and laughter were provided in the shape of Pass the parcel, Guess the sweeties in the jar and a Lucky dip. It’s safe to say everyone had great fun. The staff, as always got into the spirit for such a great cause. Massive thanks again to Lucy for organising. We are so lucky to have a great team!